Measure the width of the area you would like to cover. This is your ordering width (fullness is already accounted for). Tips: We recommend whenever possible to extend out from the edges of your window or doors as much as 6” – 12” on each side. This will help make the area look larger, and will also maintain as much natural light as possible. 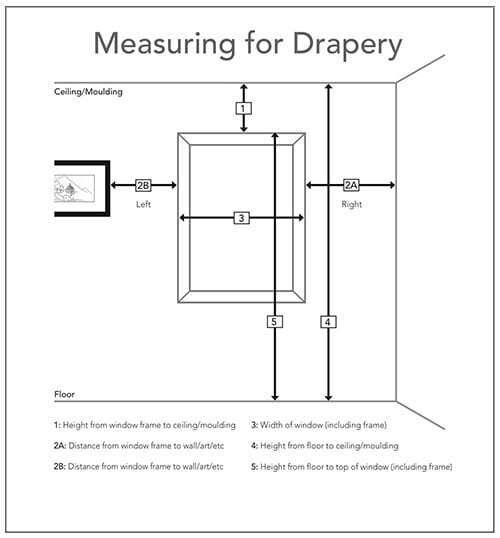 • Take the measurement from the top of where you will mount the hardware to the floor (for wall mount) or from ceiling to floor (for ceiling mount). Color and size of the rod in which you are installing. Measuring for your valance is quite easy. Measure the width you would like to cover. This is typically the width of the window including any molding around the window. We suggest adding 2”-3” to your measurement (if wall space allows). Keep in mind, if you will be layering the valance over blinds or drapes, as you will need to make sure you add enough width and projection to go past any rods etc. Select the projection of the board, either 3 ½”, 4 ½” or 5 ½”. Most will use the standard 3 ½” unless they have wide blinds or draperies under the valance. The projection of the board is the same as the depth of the board. You will need a wider depth, or projection to mount the board over rods etc. If you are measuring for a triple window valance, please measure the center window section for the window which you are ordering for, and provide the width while ordering. The reason for this is so that the center pleat of fabric will be centered with the center window. SIMPLY FOLLOW OUR STEP-BY-STEP INSTRUCTIONS, AND YOUR BEAUTIFUL NEW SHADES WILL SOON BE ENHANCING YOUR HOME OR WORK SPACE FOR MANY YEARS TO COME. Because not all windows are perfect rectangles, we recommend measuring the window in 3 places to get your width: across the top, middle and bottom. Round all measurements to the nearest 1/8”. Take the smallest number. This is your ordering width. We will make the necessary deductions. Finding the length is a similar process, measuring the length of the window in 3 places on the window: left, center, and right. Round al measurements to the nearest 1/8”. Take the largest number. This is your ordering length. Measure the width of the area you wish to cover. If space allows, we recommend adding 2”-3” (1”1 - 1/2” to each side) to this measurement to help eliminate light seepage. This is your ordering width and will be the overall measurement of the shade. Note: For outside mount shades in the classic style with the fabric valance, please note the valance will be 1” wider than your ordered with due to returns.